Situated On A Gorgeous Tree-Lined Street, Steps From Lake Ontario And Prince Of Wales Park. 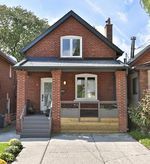 This 3 Bedroom, 2 Bathroom Home Has Been Updated, Renovated And Is Move In Ready. Located On A Deep 159 Foot Lot With A Private Expansive Yard & A Deck Perfect For Entertaining. Views Of The Lake And Original Character Make This House Irresistible Yet Functional. Finished Basement, Garage, 2 Car Private Drive. Minutes To The Downtown Core, Transit & All Amenities! !